Crankshaft pulley removing tool, made to fit all mk1, mk2 & mk2.5 models, 09/1990-2005. When the engine is revised (timing belt, camshaft seals, CAS sensor seal) normally the seal of the crankshaft pulley needs to be changed, as it tends to leak after a while. To be able to remove it the huge 22 nut needs to be removed, but nothing is holding the crankshaft from spinning. 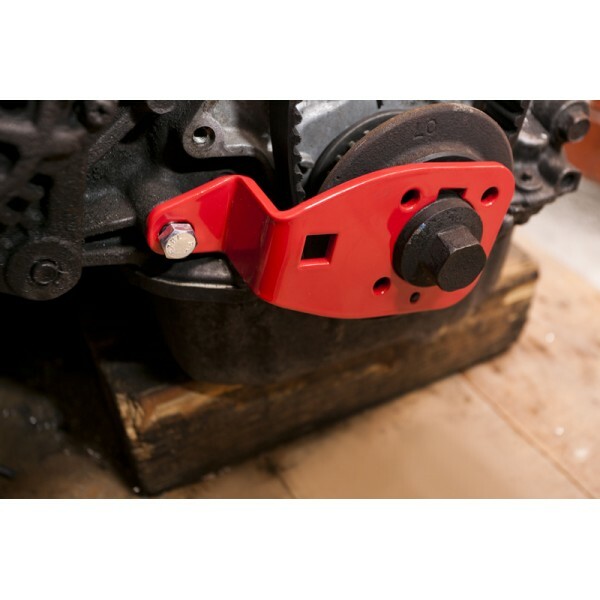 This is where this tool comes handy - it locks the engine and saves lots of time and trouble. 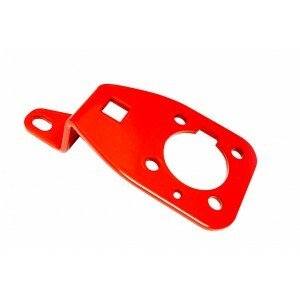 The finish is powdercoated red. Note that this does NOT fit the very early mk1 1.6 models, 1989-90, which has 4 slots in the face of the outer crank pulley. It fits all the later models where the outer pulley bolts to the pulley boss with 4 x 10mm head bolts.